Around much of the Lake the mountains fall precipitously into the water. The less mountainous area surrounding the West Corner, however, attracted settlers to farm the sections. The milling operations at Outlet Mills in the early 1840s also provided employment to the Lake farmers in slack seasons. Settlers purchased farming lands, often in fifty acre plots, on contract from Hollenback and Urquhart. After a settler completed payments on a farm over a number of years, Hollenback would provide a deed to the property. A number of farmers received title to West Corner lands in the 1860’s including J. P. Forgason in September 1864, John Smith in March 1865, and John Long in September 1866. Mosas C. Perrego settled at the West Corner in 1841 and obtained a contract in August 1853 for 109 acres of farmland that were conveyed to him in 1865. The West corner remained a quiet farming settlement until the turn of the century. A church class at the West Corner was organized in 1845 and initially met in homes until a schoolhouse was built in 1849. The Perrego Cemetery at West Corner was set aside on a knoll overlooking the Lake. Sara Perrego was the earliest interment in June 1852. In 1889 Abel Perrego donated a lot at the West Corner for a Methodist-Episcopal Church although the terms of his gift permitted all denominations to offer religious services when the M. E. was not using it. A tablet on their early frame church read “Harvey’s Lake M. P. Church.” An early sexton in 1893 stated the “P” was for “Piscopal.” This church was destroyed on July 4, 1905, after a stray firework set it ablaze. The church was not rebuilt until 1912 as the Laketon Methodst-Protestant or M.P. Church. In 1923 a Lutheran congregation began services there and in 1926 it was chartered as the Lutheran Church of the Reformation of Laketon. In the modern era the church was vacated and in 2017-18 it was being renovated as a private residence. As the century ended, the West Corner was the subject of legal controversy. In October 1895 Ephraim Troxell rebuilt the dam at the Outlet. The Lake was three feet deep at the old dam, and Troxell’s improvement raised the water another two feet. When the new dam raised the Lake, it partially flooded the beach lands at the West Corner that were owned by Mary C. Lynch, wife of John Lynch, a local judge. Lynch had purchased her three acre farm at the Lake in July 1895. The Lynch family cleared the two small streams entering the Lake at the West Corner and built stone walls along the beach and streams. When the new dam at the Outlet flooded the Lynch beach, Troxell agreed to lower the Lake by eighteen inches. The lowered water, however, created stench pools in other areas of the Lake causing health problems. But a higher water level benefited the operations of the steamboat company and the Albert Lewis lumber company. 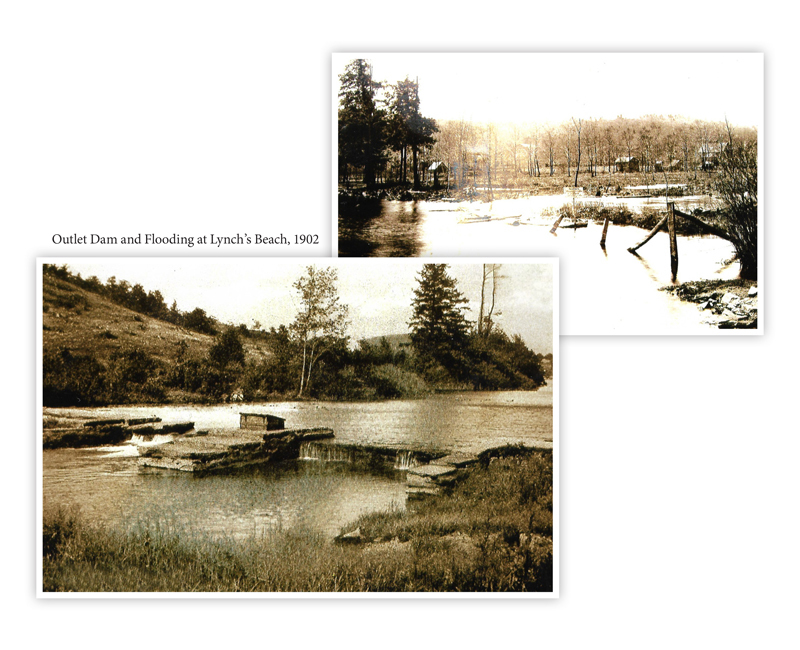 In 1899 Troxell raised the water level of the Lake and again flooded the Lynch property. Lynch filed a legal action against Troxell, and in January 1902 a court jury found Troxell responsible for damages to the Lynch lands and awarded seven thousand dollars for losses. Troxell appealed the case to the Pennsylvania Supreme Court which, in October 1903, found Troxell would be liable for damages but awarded him a new trial because of certain trial questions. In May 1903 Ephraim Troxell died and his children and heirs Dr. Edgar R. Troxell and C. Rosa Troxell controlled the Lake property. In June 1907 a local jury again awarded Mary C. Lynch $3,000.00 for property damage due to the raising of the Troxell dam. Several years later Mary C. Lynch again sued the Troxell heirs when additional flooding of the Lynch land occurred. Nearly all Lake cottage owners supported the raised Troxell dam height. Apparently, too, the Troxells failed to honor a private agreement earlier with Lynch to lower the dam. In May 1910 a jury deadlocked on the issue and the case was unresolved. In the meantime in the late Summer of 1908 a drought struck the region. The North Mountain Water Supply Company depended on the Lake and Harvey’s Creek for water to serve Nanticoke and the Glen Lyon areas including the Susquehanna Coal Company breaker operations. The water supply was dangerously low. The company obtained an emergency court order on September 19, 1908, directing the Troxell heirs to lower the dam to permit a release of Lake water into Harvey’s Creek. The court order was lifted later in the month as the drought subsided but the court held the emergency order could automatically apply in future similar circumstances. In May 1911 the Pennsylvania Supreme Court set aside the automatic injunction provision. The Troxell heirs sued the water company in April 1912 claiming the earlier court injunction caused financial losses to the heirs who were to receive royalties for water releases. Then in January 1913 Troxell’s lawyer Charles D. Shea filed a petition with the General Assembly in Harrisburg to impeach Judge Henry A. Fuller who had issued the 1908 injunction over the Troxell dam. Shea also alleged numerous other claims against the Judge. A state legislative commission met in Wilkes-Barre to hear the charges which provided farcical relief to the Valley. Even E. R. Troxell did not support the charges in his own case. In May 1913 the legislative commission exonerated Judge Fuller. The April 1912 case by the Troxells against the water company which sought $46,000.00 for claimed loss of over 450,000,000 gallons of Lake water due to the September 1908 injunction, was settled for a $500.00 payment to the Troxell Estate. Irwin A. Rood came to the Lake from Sweet Valley in 1898. He taught at the one-room Rock School on Sorber Mountain for two years, but in 1901 he purchased the Al Goode store at the West Corner. Rood ran an early horse and wagon school-bus service, and in 1918 he became the Laketon postmaster, a post he served until 1937. Two generations of the Rood family managed the general store and served the West Corner until 1965. 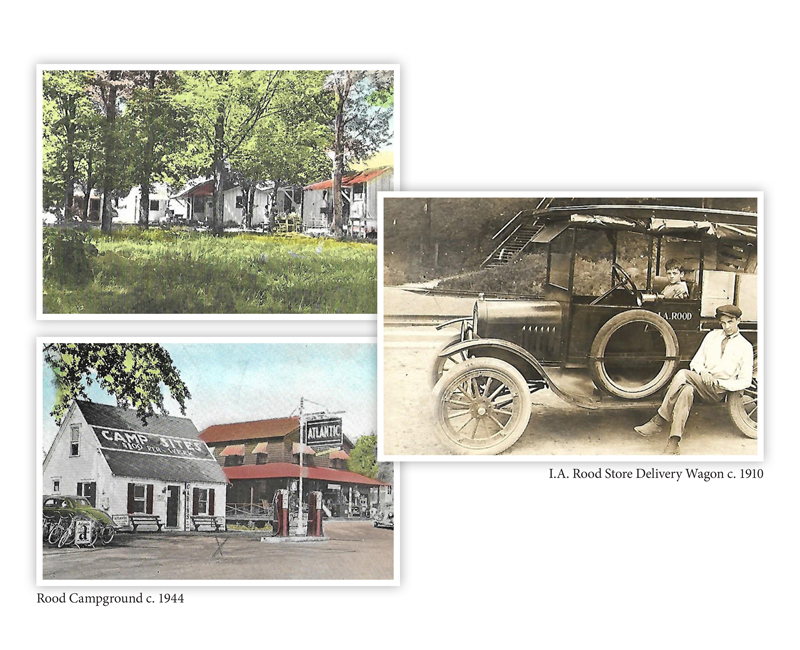 In the early decades of this century, three principal grocery stores served the Lake. Rood was at the West Corner, Gosart was at Sunset and the Harvey’s Lake Supply Store was at Alderson. Rood’s home delivery schedule was typical for Lake stores. On Mondays and Fridays orders and deliveries were made “up-Lake” to Alderson, and on Tuesdays and Saturdays orders and deliveries were made “down-Lake” to Warden Place. Wednesdays and Thursdays were usually reserved to receive telephone orders and to make deliveries to other areas of the township. During this time major stores in the Valley also had regular merchandise delivery services to the Lake. In 1928 Ben and Vernon Rood, the two sons of I.A. Rood, began to rent tent sites on a large plot of land previously used as a truck farm. The tent ground was an enormously popular attraction and was frequently called Tent City. A camp site rented for two dollars weekly. In May 1930 a Pure Oil gasoline station was added, which later changed to Atlantic-Richfield. The tent ground soon attracted trailers. In 1933 five rental cabins were built. In 1934 I.A. Rood dismantled his bowling alley and game stands along the Noxen Road, and the lumber was used to build four additional cabins. Shortly, additional cabins were built until sixteen cabins were available. They were one, two and three-room cabins which originally rented for fifteen, twenty and twenty-five dollars a week. At the height of its popularity, the Rood camp ground would accommodate six hundred people in 125 tent sites, fifty trailer sites and the sixteen cabins. In 1935 Rood built the Martha Washington Inn. It had rooms for four to six boarders in addition to a restaurant trade, and until World War II it was managed by August Gomes. When the trolley line ended its service to the Oneonta station in July 1931, the trolley company substituted a bus between Idetown and the Lake. But in September the trolley line pulled its line back to Dallas. The Wyoming Auto Bus Company, a subsidiary of the trolley line, leased the bus line to I.A. Rood from Dallas to the Lake for the 1931-1932 winter season. The company originally planned to operate its own bus line during the profitable summer months, but the Rood bus service was so well-managed the company leased the line of a year-round basis to the Rood family from 1932 to 1957. The bus line was managed by Ben Rood, and his initial bus was a twenty-passenger 1932 Ford. During the summer months the traction company provided larger forty-passenger buses. The number of buses furnished to Rood during a season varied with consumer demand. As many as seven buses were run on a particularly heavy holiday. As early as 5:30 A.M. miners who lived at the Lake would be picked up by the Lake bus at the Picnic Grounds in order to meet the 6:00 A.M. trolley at Dallas to the Valley. Except during summer, the Lake bus would run each hour and twenty minutes ending at 6:40 P.M. on weekdays and 10:40 P.M. on Saturdays. In summer months the bus ran until midnight. The ride from Dallas to Idetown was ten cents, or twenty cents for a stop along the Lake. The best years for the bus line were 1941-1946, largely due to gas rationing that restricted private travel. Over time the twelve daily trips were reduced to six, and Rood’s bus service ended in 1957. In 1963 environmental and sewage control regulations compelled Benjamin Rood to close Rood’s cabin rental service and camp ground after the Summer season. Razing the cabins began in 1964. Sandy Beach was developed by Thomas Pugh and William B. Davis. Pugh was the owner of Pugh’s Market in Edwardsville and well-known to the West Side. Davis was a partner in the Davis Brothers’ Automobile Company selling Graham-Paige automobiles near Kingston Corner. In October 1924 Pugh and Davis began a series of purchases until they acquired most of the beach lands. Tons of fill were brought to the area for the rough spots. A preferred fill was the flat rocks from stone fences at area farms. Sand was brought by train to Alderson and trucked to the beach. The bill was filed, and has been vigorously pursued, on behalf of the home-loving, Sabbath-renting, quiet-seeking and summer-cottage recuperating element at Harvey’s Lake, a sheet of water which, in keeping with its beauty, ought to bear its proper historic Indian appellation, Lake Shawnee, against the alleged intention of the defendants to establish a convenient place where the pleasure-seeking public may cleanse their bodies, appease their hunger, park their automobiles, perhaps, and perhaps not, indulge in the giddy diversions incident to merry-go-rounds, scenic railways, shooting galleries, and bowling alleys. There was no legal basis, however, to prohibit the development of Sandy Beach. In June 1925 the court tried to strike a balance between the litigants by allowing the beach but prohibiting a dance area. Following the decision of the court, Sandy Beach was rushed into preparation for a preliminary opening on July 4, 1925, although the bathhouse was still under construction. The following season Sandy Beach was in full operation. On Saturday, May 29, 1926, Sandy Beach had a more formal opening with completed facilities. There was free parking for 1,000 cars, a large picnic area, and a bath house with 800 lockers. New for 1926 was a modern restaurant serving sandwiches and simple meals. The restaurant had a porch from which parents could watch their children swimming in a special safety zone. In July 1926 Sandy Beach offered a demonstration of life saving techniques, first aid, swimming and fancy diving sponsored by the Wyoming Valley Life Saving Association. This event launched a series of life saving and swimming courses for many years at the beach. Independence Day 1926 was a three-day affair. The ban on musical entertainment was ignored as Gilligan’s Orchestra played for the Sandy Beach crowds Saturday, Sunday and Monday. The new parks also sponsored swimming races, a high diving contest, and a speedboat race between two motorboats equipped with Curtis aeroplane engines. They could travel sixty-five miles per hour. The evenings featured fireworks at the beach. The large one-story restaurant fronting the Lake was built in the center of the park. To the right of the restaurant was a large bathhouse for men and women. In 1928 Sandy Beach rented Bradley bathing suits. In late December 1927 the local court ruled that Pugh and Davis could operate a dancing pavilion and merry-go-round at Sandy beach and on the west corner of the park a one-story dance hall was built. The Sandy Beach seasons of 1928 and 1929 were generally consumed by professional boxing. In early July 1928 world light heavy-weight boxing champion Tommy Loughran arrived at Sandy Beach for an upcoming bout with a regional contender Pete Lotzo. Loughran was a guest at the Pugh cottage. On July 8, 1928, State Police had to handle over 7,000 boxing fans who overwhelmed the Sandy Beach area to view Loughran training with local sparring partners. On July 16, 1928, at Artillery Park, Wilkes-Barre, Loughran won a unanimous decision over Latzo in a ten-round match. It was the only boxing championship fight ever held in the anthracite field. In May 1929 Sandy Beach opened the Memorial Day season with the addition of a merry-go-round, dodgem, whip and a form of roller-coaster. But the holiday opening turned tragic when 17 year-old Andrew Malker of Kingston suffered a fractured neck in a diving accident at the beach. He died several hours later at the family home. 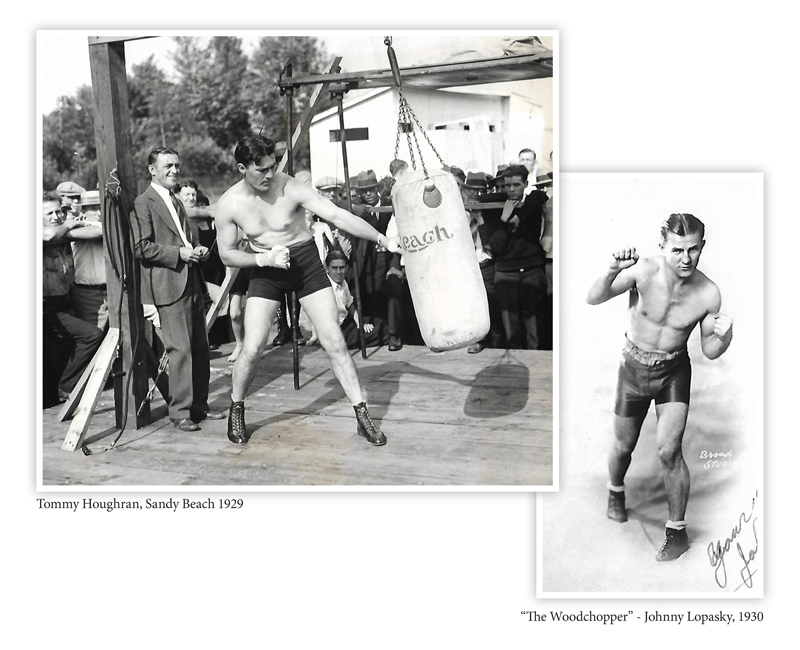 In late June 1929 Tommy Loughran returned to Sandy Beach to train for a match with Jersey City’s James L. Braddock. Local sparring partners included Frankie Cawley and Jack Wolf. Loughran won a decision over Braddock after 15 rounds on July 18, 1929, at Yankee Stadium. Braddock was the subject of the 2005 film Cinderella Man starring Russell Crowe. In July 1929 world middle-weight champion Mickey Walker arrived at Sandy Beach to prepare for a match against Leo Lomski on August 19. Hundreds of spectators watched his practice bouts with local partners, Gene Cordi and Al Fay. Cordi remarked that Walker could punch like the kick of a mule. Walker won the match against Lomski in Philadelphia. The West Corner was also the home of middle-weight boxer Johnny Lopasky who likely utilized Sandy Beach for practice sessions. A Lake native known as the “Woodchopper,” Lopasky had twenty-three professional fight engagements beginning in May 1927 at the New Oneonta Pavilion and ending in November 1935 in Newark. He had a win record of 15 bouts; eight were knock-outs. He tied in four bouts and lost four. Swimming was now the nation’s third most popular sport behind baseball and boxing. The success of Johnny Weismuller in the 1924 and 1928 Olympics drove the sport as would Buster Crabb’s Olympic gold-medal in swimming in 1932. Locally, the sport was heightened by Kingston’s Helen Hoffman who was a member of the United States Olympic team in 1928. In the Summer of 1929 73,600 men, women and children visited Sandy Beach to swim. While Sandy Beach did not have the amusement ride scale of the Picnic Grounds, it could match the older park in beach and dance attractions in the early 1930s particularly after the loss of the Sunset attractions in the great fire of 1929. The Sandy Beach dances were very popular, and crowds drawn by name dance bands could not be contained in the original dance hall. The one-story dance pavilion was removed, and on Memorial Day 1930 a new two-story dance hall was opened with Eddie Worth’s Master Musicians from Greenwich Village, New York. The second story was used for dancing while the first floor became the men’s bathhouse. The original bathhouse on the opposite side of the park was reserved as a women’s bathhouse and as a rental area for canoes and rowboats. By this time the Whip was also added to the amusement area. In time the most popular bands of the 1930’s were to play at Sandy Beach. Sandy Beach engaged expensive bands for the dance hall. The Eddie Worth novelty orchestra for Decoration Day 1930 came direct from Greenwich Village in New York City. Terrence Tracey, who managed the dance hall, engaged the huge U.S.S. Leviathan Band in June 1930. In early 1930 Sandy Beach offered a dance academy led by dancing master Terrence Tracey and the new $30,000 ball-room overlooking the Lake. The grounds were now advertised as “Wyoming Valley’s Seashore-At-Home.” The ballroom was 50 X 125 feet in size, had a seven-foot wide promenade surrounding the dance floor and was enclosed with French glass windows. The beach’s bath houses were underneath the dance hall. Outside the beach area there were ample picnic tables under shading trees, swings and teeter-totters while private police patrolled the parking areas and certified life-guards watched the beach. For the 1930 season a new pier was erected at Sandy Beach to accommodate the Lake’s steamboats which could meet trolley passengers at Sunset to have them to the beach in coordination with trolley schedules. Throughout the Summer of 1930 Sandy Beach continued to engage national orchestra talent which may have led to its financial difficulties. Anticipating new dance fashions Tracey offered free dance lessons in the Tango for the Fall 1930. A degree of financial protection was sought when Pugh and Davis in October 1930 incorporated their holdings as the Sandy Beach Amusement Company. On holidays and weekends Sandy Beach held dances from midnight to 4:00 A.M., and patrons were invited to “see the run rise.” The steamboat company, facing extinction from the automobile, desperately sought to tie itself to the popularity of Sandy Beach by running excursions to the weekend dances at the beach. By this time, however, the automobile was firmly rooted and the trolley and steamboat lines were doomed. The “big band” dances would end with World War II, and when roller skating was introduced in the dance hall. On June 30, 1931, Johnny Weissmuller, the 1924 and 1928 Olympic champion and later star of the Tarzan movies, was in Wyoming Valley for a swimming exhibition. At the time the six foot two sensation held forty-nine world records. After a morning demonstration in the Susquehanna River near the Market Street Bridge, Weissmuller travelled to Sandy Beach where he equaled his forty-nine second record for a one hundred yard course. Weissmuller was joined in the water exhibitions by Stubby Krueger, a swimming and diving comedian who was a former world swimming champion. The Weissmuller and Krueger visit to the Lake was sponsored by a national swimwear manufacturer. The Weissmuller visit is more fully covered at www.harveyslake.org. 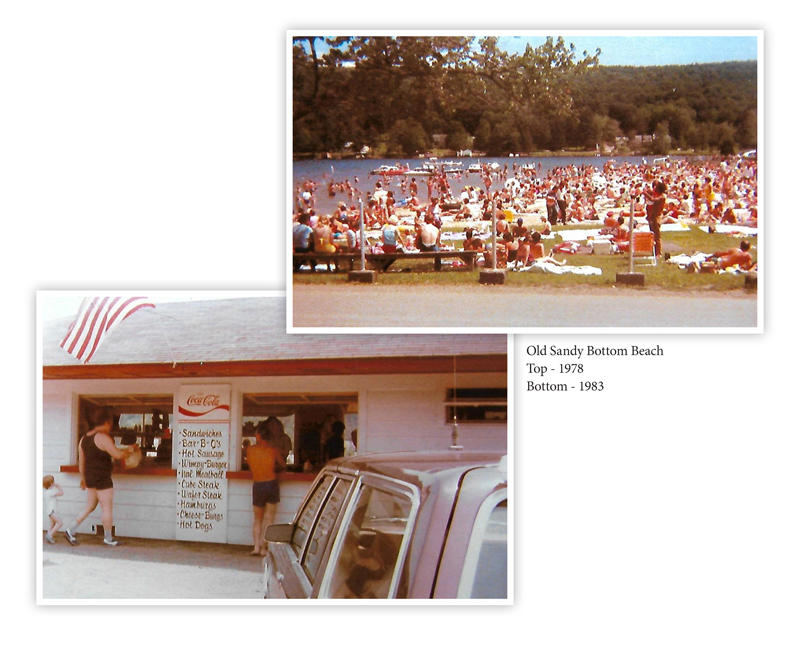 When Sandy Beach was originally opened, a long swimming dock stretched out into the Lake from the center of the beach. At the end of the dock was a high diving board. Over the years the dock was shortened until finally it was replaced by a large floating dock anchored in the deeper water. A small dock was also built in front of the dance hall. For a time there was a children’s sliding board on the water front. Another beach attraction was a shoot-the-chute built near the original bathhouse. Although the chute survived into the 1940’s, it was not nearly as grand as the chute at the Picnic Grounds. The beach area ended at West End Creek and did not extend into the area known later as Old Sandy Bottom. There were also other popular features over the years near Sandy Beach. The roadside structure, known in later years as the Anchor Inn, was originally built as a garage by Tony Mayer. He also maintained an ice cream factory in the rear of the property. An ice cream stand was maintained across the road from the garage. John M. Bauer and Conrad Yeager remodeled the garage into a store in 1926. Bauer and Yeager had opened a store at the West Corner next to the Rood store in 1925, but the new location at the end of the West Corner bridge was a wise move as it had the advantage of coinciding with the opening of Sandy Beach. Bauer and Yeager carried a general line, as well as newspaper and the franchise for Dolly Madison ice cream. Initially, the Bauer and Yeager store was open all year like the Rood store, but in later years Bauer and Yeager was generally open from May to September. It was a favorite stop for children in the West Corner area, who would buy a treat on the way home from the Laketon school. Yeager and Bauer sold the store in 1947, and it was converted by new owners into the Anchor Inn but it is now a private home. The Wilkes-Barre Railway Corporation would end trolley service from Idetown to the Lake, and later terminate service from Dallas to the Lake in the 1930s. This action severely impacted the Lake’s steamboat corporation. By July 1931 the steamboats were basically operating only from Sandy Beach for sight-seeing excursions. Pugh also arranged to lease the boats, generally the double-decker steamboat Natoma, for parties which were detrimental to the steamboats. With the retreat of the trolley additional bus services to and around the Lake were added in 1931. Stops included the Picnic Grounds and Sandy Beach, running between Wilkes-Barre and the Lake from 5:30 A.M. to midnight. In the meantime Sandy Beach continued to offer national entertainment features. Blanche Calloway, Broadway star of the musical Shuffle Along and sister of famed “Cab” Calloway, came to Sandy Beach on July 18, 1931. Young people were also drawn to the dance hall for free dance lessons in the Collegiate Rumba, a Broadway craze, and also in the Spanish Waltz. As the Depression took hold, Sandy Beach sought to provide “the best music at minimum prices.” Admission to the dances were now 25 cents for ladies and 35 cents for gents. There was an increasing member of cottagers in the Sandy Beach area and in 1933 Sunday Mass programs were introduced at the beach pavilion. Sandy Beach also was the site for annual fund raising picnics to support the Lady of Victory church at Warden Place which opened for the Catholic faith in 1923. By April of 1936 both Sandy Beach and Fernbrook Park in Dallas were in serious financial distress. All of Fernbrook Park’s equipment and structures were sold in a sheriff sale to Samuel Insalaco and Paul Griesmen who planned to renovate and reopen the park. Sandy Beach was foreclosed by Kingston Bank which held a mortgage on the property. At the sheriff sale the property was sold on June 12, 1936 to Margaret Pugh, sister of Thomas Pugh, for $70,000. Effectively William V. Davis no longer was an owner and Margaret Pugh retained her brother, Thomas Pugh, to manage Sandy Beach. By this time Bingo was a popular attraction every Thursday night. For the balance of the decade Sandy Beach’s special attractions were limited. Local bands generally were retained and a fixture at Sandy Beach was Ralph Paul’s Orchestra. Roller skating was a nightly feature except on Thursdays when Bingo was offered. Weekend and holidays still offered dances with a ten-cent admission. 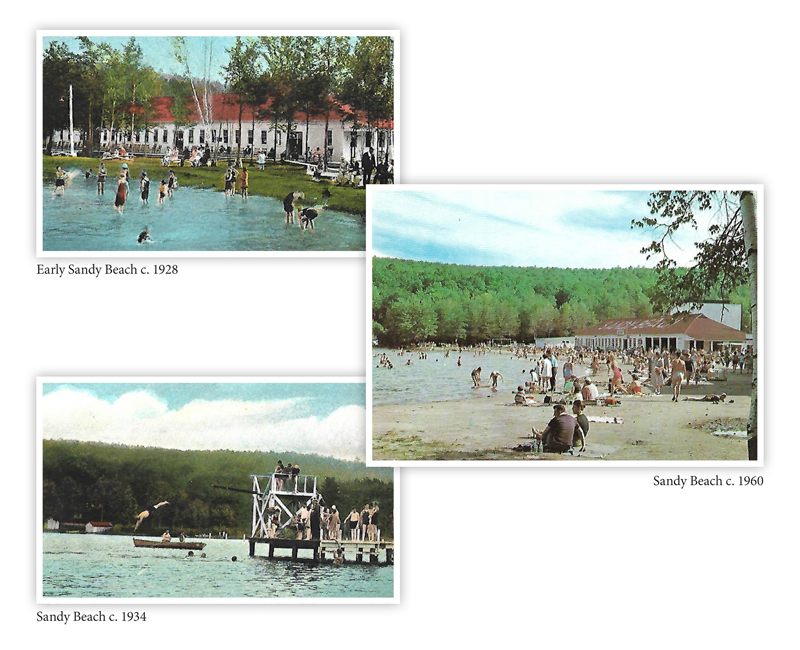 Major swimming meets were also held at Sandy Beach in the last half of the 1930s and are fully covered at www.harveyslake.org. As World War II threatened Sandy Beach activities were more conventional. In 1940 the Pennsylvania Motor Police created a sub-station at the beach with four State Police assigned to monitor the Lake. Sandy Beach promoted its bar business, roller skating and picnic grove and now polka dancing was introduced. In May 1941 at least 5,000 people visited the Picnic Grounds and Sandy Beach for Decoration Day. One Friday afternoon in August 1942 Nathan B. Iscovitz rented a boat at Sandy Beach but it capsized during a rain storm and Iscovitz drowned when the boat overturned. Perhaps with the end of the war in Europe in sight, the Lake had large crowds in the Summer of 1944. In mid-August 1,500 visitors crowded Sandy Beach. In August a young Edwardsville man, Joseph Chisarick, sank with cramps to the eight-foot bottom of the Lake at Sandy Beach. Revived by rescuers Dr. C. A. Miller was able to save the victim. Another feature of the West Corner was the 1923 home of Capt Chalkey N. Booth, built near the beach and popularly known as the Stone House. Booth was a Spanish War veteran and chief of the Lehigh Valley Coal Company’s private police force. Pugh and Davis acquired the Stone House and had leased it to Richard Habsacker as a roadhouse. The basement gas tans exploded on December 27, 1930. Patrons and the orchestra fled and Habsakcer had facial burns. A rebuilt New Stone House opened in May 1931. From 1933 to 1946 the Stone House was the quietly maintained bar of Jimmie Brennan. Brennan died in August 1944 at age 58 from a heart attack. In his youth he had local name as a stage actor in Wilkes-Barre and Scranton with the Poli Stock Company before entering the automobile sales business. In March 1948 785 feet of the Lake front at Sandy Beach was acquired by Samuel and Alice Slomowitz. He purchased additional Sandy Beach property in August 1961. Slomowitz improved the park with the addition of Kiddie-Land, an amusement area near the dance hall. He acquired a new Merry-Go-Round and new children’s rides for the small amusement park. Slomowitz also converted the restaurant into a cafeteria. On June 12, 1948, the Sandy Beach Drive-in was opened. Built by Ray Heddon of Dallas, it was completely modern, with in-car speakers and inclined parking. 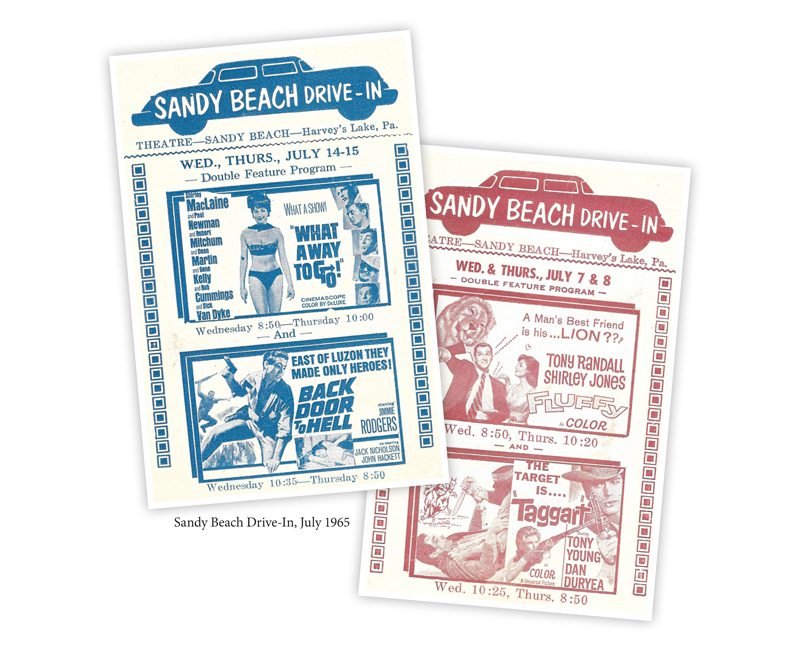 The Saturday grand opening of the Sandy Beach Drive-in featured the technicolor musical I’ve Always Loved You. Regular movie features began on June 13, 1948, with the comedy The Time, The Place, The Girl, starring Dennis Morgan and Jack Carson. The drive-in was enormously popular and ran for twenty seasons. The Sandy Beach Drive-In was unique. Each parking space had an inclined ramp for better screen viewing but drivers were unfamiliar with the innovation. There were in-car speakers on poles and curb service to order fast-food from the beach’s restaurant. Children under age twelve were admitted free to the movies. Neighborhood children of any age could also come to the pavilion to hear and view the movies at no charge. There were other improvements added to Sandy Beach by Sam Slomowitz. The original bathhouse was removed to provide enlarged sanitary facilities. Men and women’s locker rooms were now located under the original dance hall. The dock in front of the dance hall was lengthened and forty rental slips for boats were made. U-drive boats, with three horsepower motors, were rented to the public, but after a few years the small powerboats were withdrawn in favor of paddle-boats. Eventually, rental boats were discarded in favor of Lake cruises on a pontoon boat. Slomowitz also improved the beach with tons of white sand from Atlantic City. Bingo was also added in the pavilion under the supervision of John Lynch. It was a lucky child whose parents had a cottage at the West Corner or whose family rented one of Rood’s cabins for a week. Sandy Beach had all the attractions of a small resort. It was a delight to fill the hours with the exhausting adventures of a summer day at Sandy Beach. Some of the camp children could earn welcome change early in the morning by helping to clear the Sandy Beach Drive-in of the candy wrappers and small trash thrown from the cars during the evening. By mid-morning, before the beach attracted too many people, the cottage and camp children could scout for schools of minnows sheltered in the shallow water along the beach. At the boat dock a little fisherman could always draw the curiosity of a few small sunfish. Bait could be found under rocks at the campground. It was a small challenge to test the morning water, which had a cool momentary sting after a summer rain. But morning water was clear, and young swimmers with raised arms would inch through the cool water until they were chest-high before taking a final plunge to wet the face and hair. Once the ritual of immersion was completed, a swimmer would jump along the sandy bottom before swimming the last few yards to the floating dock. The large square dock was set on a metal drums and anchored to the bottom by a metal chain. The dock sat in six feet of water, and there was always a contest to become the first swimmer in the gang to climb on top the dock and to push away straggling friends. A swim to the dock was usually the outer limit; it was challenge enough. Few swimmers swam further into the Lake; beyond the dock was a large weed bed, and the stringy, green underwater forest reached nearly to the surface and would slap the legs of those few swimmers who ventured out. By mid-afternoon the beach was a patchwork of colored towels, and the warm water had a fine silty sense. Toddlers with toy shovels crowded the shoreline spilling the watery sand into small metal pails. Beyond the shore the shallow water was filled with splashing pranksters; there were always a couple of waxen older people wading among the gaity. The sand would ooze between the toes, and there was always uncertainty whether a sharp step was caused by a broken shell or by an imaginative water devil lurking along the mushy bottom of the Lake. The floating dock was often overflowing with loud teenagers. At best a young swimmer could only hang on to the anchor chain until a couple of divers cleared a cherished corner of the dock for a few moments. For the camper whose morning beach kingdom was lost to the afternoon crowd, it was time to explore the fringes of the beach. But the water along the creeks entering the West Corner was always too brackish to attract any lasting interest; it was time to dress for a while and explore the arcade. The Sandy Beach arcade was more modern than Hanson’s, but it was also smaller and less versatile. Perhaps it had too many pinball machines whose swarthy teenage challengers crowded out the smaller kids. But there were other amusements with little prizes which could always tease the change out of tight, wet dungaree pockets and into hungry, round nickel slots. What change was saved was reserved for the restaurant or ice cream stands. The Sandy Beach cafeteria served a variety of sandwich and ice cream delights. The favorite treat, quicker than a hamburg, was a big, juice hot dog in a soft, steamy bun. Then there were French fries jumped into a slippery paper cone; topped with a splash of vinegar, the fries were golden crisp with a hot, white center. A second run to the cafeteria line brought a flavored twin popsicle expertly split by cracking the center against the edge of the counter. Late in the afternoon the crowds would begin to clear for dinner. There was time for one last race to the floating dock before bundling into a towel for a barefooted walk to the car or cabin to change. At 6:00 P.M. the drive-in was cleared of cars to prepare for the evening movie. The summer evening fell quickly and by 7:00 P.M. the dark, stubby sedans of an earlier time would begin to stream into the lot. The movie changed every few days, and in a lucky week, a camper or boarder at the Lake could see four different movies by sneaking in the Sandy Beach lot for the 7:45 P.M. early show. There was always a small crowd of kids parked in blankets along the fence. A car speaker really did not matter. Everyone knew that the western hero, Randolph Scott, the tall, elegant Virginian of countless childhood scripts, would get his man. By 9:00 P.M. a still silver moon and the evening chill signaled the end of the long carefree day, and it was time to begin the weary tramp to the cottage. 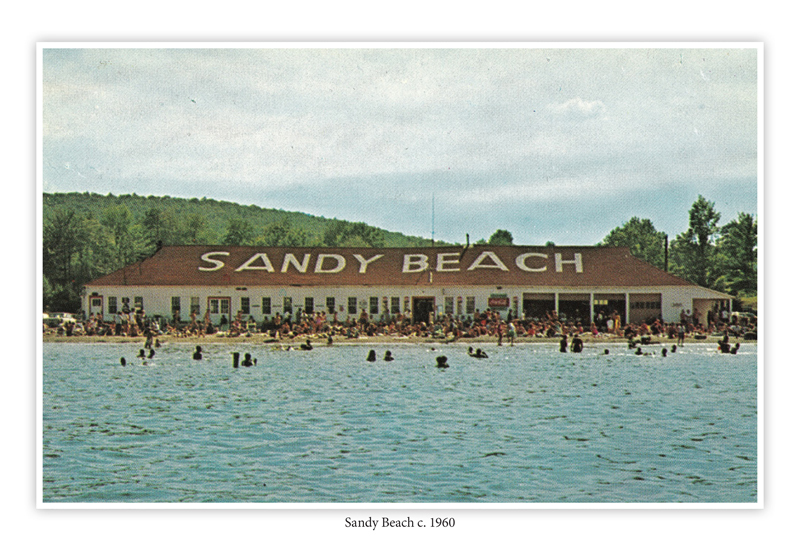 For another generation after the 1950’s, Sandy Beach continued to attract large crowds. 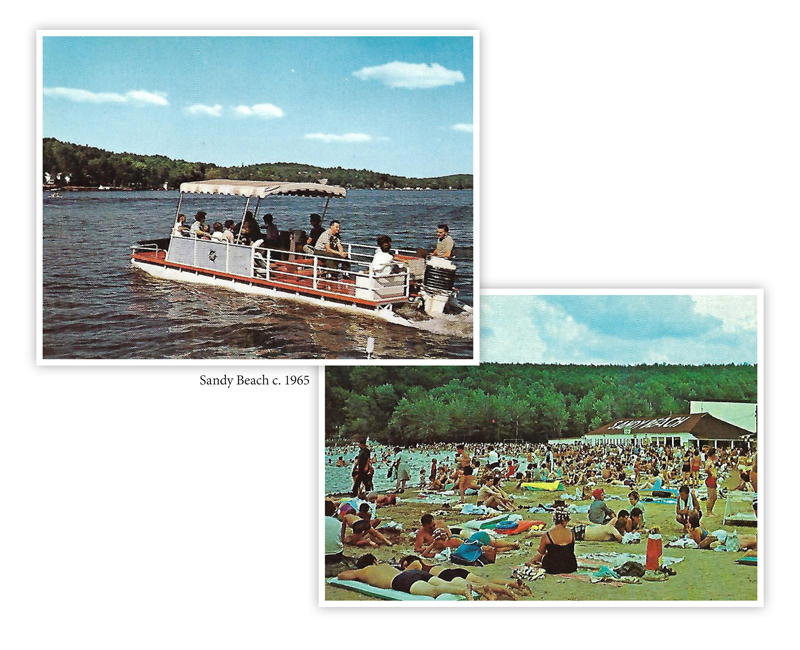 It was the largest public beach at the Lake, especially after the addition of Old Sandy Bottom. But the changing recreational demands of the public challenged the owners of area parks to attract large crowds. The cost of innovations to maintain public interest often taxed the resources of family-owned parks. Then, too, parks became casualties of the costs of compliance with increased environmental and safety standards. There was renewed interest in Sandy Beach when dances were revived at the Sandy Beach restaurant during the rock and roll era in the mid-1960’s. Eddie Day and his bands, along with other popular dance talents like Dennis Yost and The Classic IV and Johnnie Maestro and The Brooklyn Bridge, played at Sandy Beach. But the beach itself was attracting smaller crowds, and the Sandy Beach Drive-in was closed after the 1968 season. The movie screen was destroyed by a severe wind storm on Sunday, February 9, 1969. Part of the screen landed on the Lake road while other parts felled power lines and a section of the screen sheared off the top of a utility pole. Alice Slomowitz felt there were too few family movies produced any longer to sustain rebuilding the outdoor theatre. The Slomowitz family, which had nurtured Sandy Beach for over two decades, sought to sell the park. 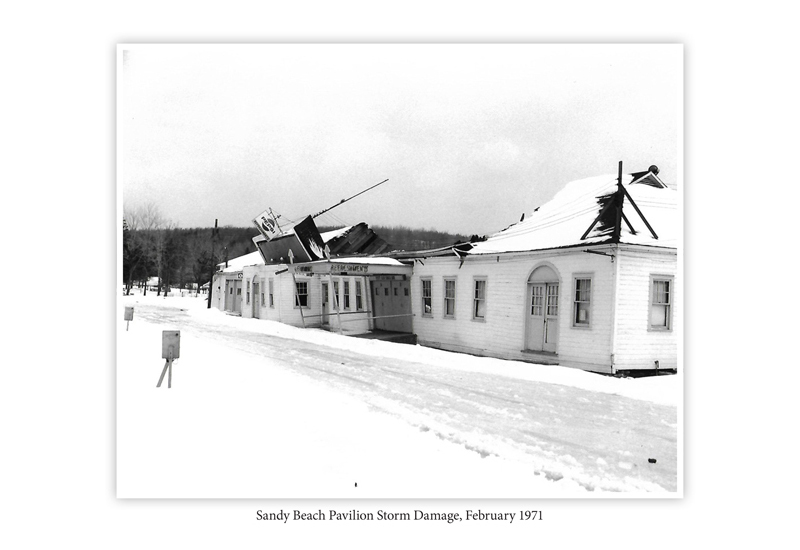 Then in mid-February 1971 heavy winter rains and melting snow caused the collapse of the roof of the main pavilion at Sandy Beach. In August 1973 Scarlet Enterprises, Inc., purchased Sandy Beach. But in late May 1974, as the season was to open, the rebuilt restaurant, which was serving as a cafeteria, arcade, and dance hall, was lost to fire. After the fire, Sandy Beach was not opened to the public, and two years later the dance hall and bathhouse were dismantled. 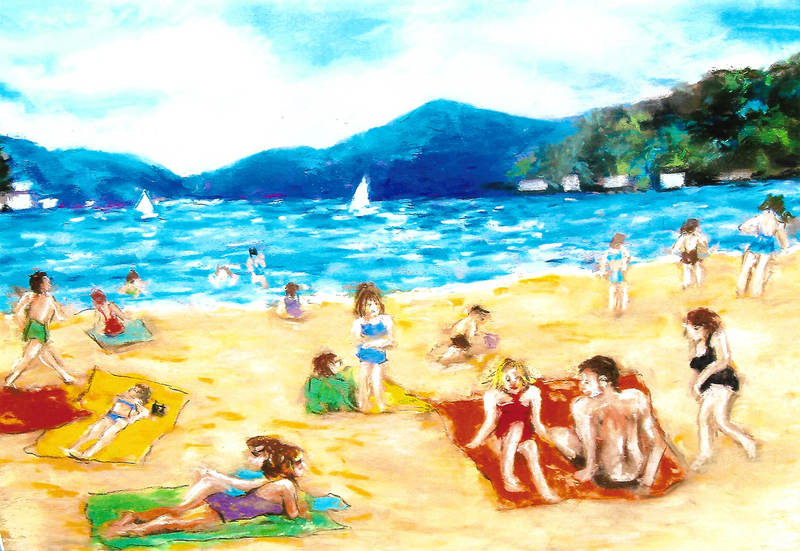 In 1976 the Harvey’s Lake Borough Council, led by Chairman Robert Wintersteen, sought to acquire the 6.8 acre Sandy Beach for a public recreation area. The Luzerne County Planning Commission approved the project in late August but several days later the Borough Council voted down the project on a 4-3 vote. Old Sandy Bottom was developed by Joseph and Margaret McCaffrey. Joseph McCaffrey was once a motorcycle officer with the Pennsylvania State Police. The McCaffreys managed a gas station and restaurant at the West Corner and later ran The Kitchen, another restaurant, and then managed the Martha Washington Inn, a Rood enterprise next to the Rood camping ground. In December 1954 the McCaffreys purchased the end of the Pugh holdings on the Lake front which became Old Sandy Bottom. This corner of the Lake was basically an undeveloped swampy area frequently used by locals to access the Lake for unsupervised swimming. A half-century earlier it was the Lynch property flooded by the Troxell dam controversy. The McCaffreys had Koons Construction clear it, and they bought tons of sand from Lycoming Silica Sand Company to create Old Sandy Bottom which was opened in 1955. Here, there was a parking area, pavilion and originally a year-round restaurant. 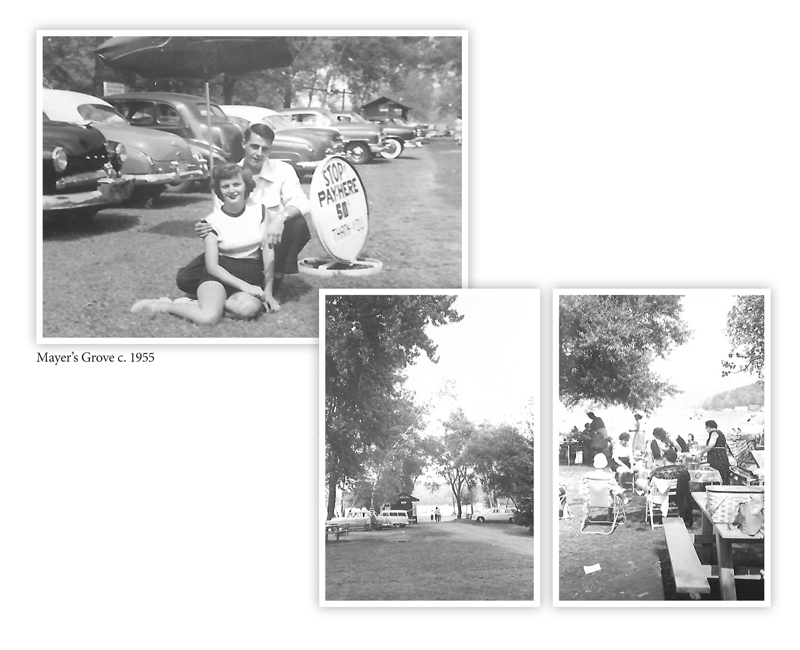 In 1961 the McCaffrey’s purchase Mayer’s Grove, a wooded picnic area between Old Sandy Bottom and Sandy Beach. Albertina Mayer, a native of Germany, and widow of David Mayer who died in 1921, purchased the Grove’s Lake front in late 1927. By 1931 Mayer’s Grove with its wooded picnic area, beach and boat slips was a quiet gathering area for church picnics and family reunions especially through the 1930s. It was also the site of the American Tragedy murder during a rainy night in July 1934. For more detail see www.harveyslake.org. Albertina Mayer died in May 1937 and the Grove descended to Charles and Letha Mayer who sold it to the McCaffreys. Old Sandy Bottom later was owned by James and Carlene Kocher McCaffrey. The family did not develop Mayer’s Grove and in September 1966 James and Carlene McCaffrey sold the greater part of the Mayer’s Grove property to the Pennsylvania Fish Commission for a public access area for boaters. James and Carlene McCaffrey operated Old Sandy Bottom until its closure at the end of the 1984 season. For a 1984 video of Old Sandy Bottom see www.harveyslake.org. 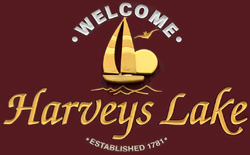 In late 1985 Old Sandy Bottom was sold to the Harvey’s Lake Beach Club, a private membership organization. A third generation of the McCaffrey family, Cory McCaffrey, now serves the Lake community as owner of Laumeyer’s Landing LLC, a marine sales and service business at Sunset created in 1995 by Michael Laumeyer who retired from the business in 2012.